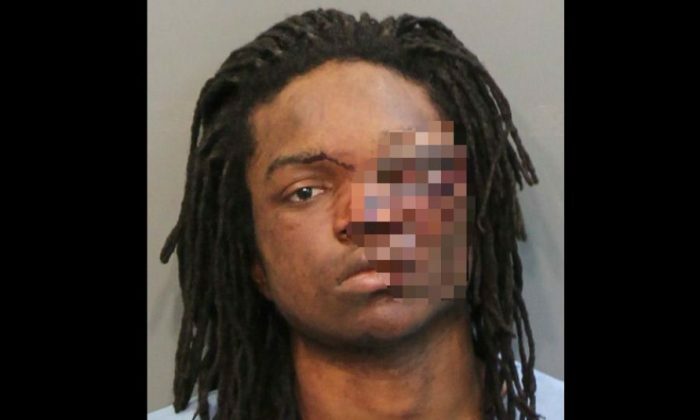 Armed with a gun, Calvin Carter III allegedly forced his way into a Chattanooga apartment—only to end up in jail with a black eye. The 22-year-old came to the northern Chattanooga house on Sunday night, June 18. Shane Feeney, 19, who was inside the apartment with a group of young people, noticed an unknown man outside and got the impression he was armed. “It sounded like he was messing with a gun,” Feeney told WRCBTV. Feeney told others in the apartment to go to the back bedroom, The Chattanoogan reported. One of them tried to climb out of a window, but ran into Carter, who held him at gunpoint and walked with him inside the apartment through the front door. At that point, Carter heard Feeney on the phone, apparently talking to the police. Carter demanded that he hand over the phone, to which Feeney complied. Feeney then grabbed Carter, while others from the apartment came to his aid. Carter managed to shoot Feeney in the thigh, but the group of five overpowered him. Eventually, police arrived and arrested Carter. He faces charges for first-degree attempted murder, aggravated burglary, reckless endangerment, and three counts of aggravated assault.